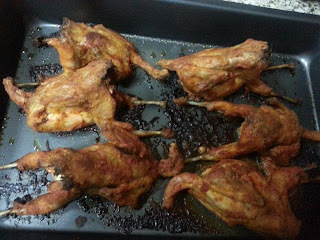 I found fresh farm grown quails in the poultry aisle and wanted to make them as it has been a real long time we had quails. 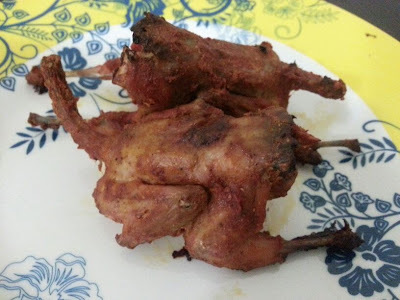 This was the first time I found quails with some good quantity meat otherwise they are usually with hardly any flesh. I sometimes deep fry them and sometimes roast them in the oven. This time I decided to roast them. They came out really well cooked both outside and inside. 1. Wash the quails well and drain all the water. You can also pat dry with kitchen towel. 2. Apply ginger garlic paste, salt and turmeric powder. 3. 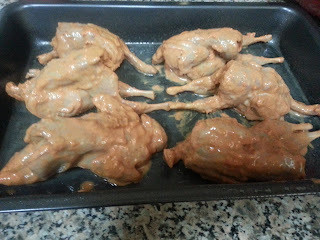 Apply all other ingredients except oil and mix well making sure the quails are evenly quoted with marinade. 4. Cover and refrigerate for 6 hours or more. 6. Spray a roasting tray with cooking spray or grease with oil. 7. Place the quails breast side down on the tray. 8. Spray them with cooking spray or apply oil on them. 9. Roast them for 1 hour or till they are done. 10. Instead of roasting you can also deep fry them in hot oil on low flame.